If you read our last post, then you were warned. Heavy, consistent rain has been falling for a couple of days now. This will continue through the weekend to some degree. Probably not as heavy or as consistent as what we have seen of the last 36 hours. High pressure over New Mexico and Arizona is blocking a Low Pressure system located just off the Southern California coast. This is causing ample moisture to work its way back east into our area. Ironically, as this moisture hits the Carson range, it is somewhat shadowed. Very little of it is making it over the Sierra and into the California valleys where it is needed most. Northern Nevada had broken out of the drought a long time ago. I believe that the same holds true for Northern California but I will let the politicians, who know nothing, argue about that in the context of man-made Global Warming. Here is a look at our current conditions. Notice the Low Pressure system sending moisture north and into our area and the Northern Rockies. 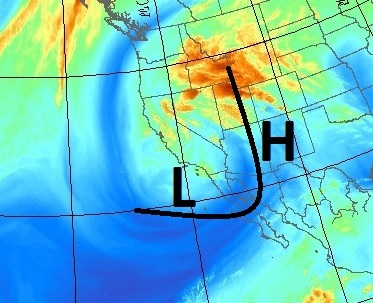 The counterclockwise rotation of the Low Pressure system will assure that waves of moisture continue to hit the leeward valleys of Northern Nevada and the Carson Range. More irony: Despite this low being off the SoCal coast, they are not receiving near the precip that we are. Slowly the blocking High Pressure system will begin to move east and that will allow the Low Pressure system to follow. I think we will have a pretty good stretch of weather starting Sunday or Monday. I see this same scenario setting up for later next week or the following weekend. This has been a pretty consistent, non-rainy season, weather pattern for the last year now as all the moisture we saw last summer, came from this exact same scenario. This pattern is what broke the drought for Northern Nevada, although it is politically incorrect to say so! Are you saying were going to see more rain later next week into the following weekend. Is the wet pattern into june still expected. I am saying there is a chance of this pattern setting up again late next week. The latest model runs are hinting perhaps next Sunday. I see no reason for this pattern to change. 4-7 nice days followed by 4-5 rainy, cloudy cool days with moisture coming from the east. Disclaimer: This pattern returned last summer for the first time in over a decade, it can leave just as quickly. Hard to quantify rain drops, but some of this moisture is coming out of the Gulf of Mexico! I see. I wonder how this monsoon season is going to be like. It's would be interesting to watch. "is blocking a Low Pressure system located just off the Southern California coast" ? It's supposed to be down here!! What a waste of El Nino ? ! By the way, has anybody checked on British Columbia, they got slammed "all" Winter long ! ? Is Tweedsmuir participating in a pre-glacial age ? But how about the Pacific Northwest ? El Nino hit them, for really the first time in the Modern Era (At least?)! The Sierra was a bit more than average, the Cascades ?